I had posted this Baroque Motifs card last week, and decided to redo it - and give it a softer feel - here's the end result. I used the same colors in my card (although this picture almost looks like "black" - it's really chocolate chip). 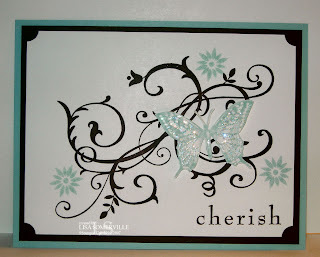 By using the ticket corner punch, adding a few flowers and the butterfly as my focal image it really softens up the card. Oh Lisa, I so LOVE the butterfly added to this. Wow! This card is so pretty! It's amazing what a difference you can make with a card and yet it's the same stamp set. Great job! The butterfly is a perfect touch! Great idea!